A good looking luxury 4 star well positioned just 1 mile from Junction 6 of the M3. 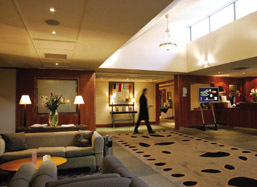 A choice of dining options and a Health Spa and Gym provide a much needed tonic for travellers. Visitors considering this progressive and well appointed 4 star hotel will inevitably be seduced by the excellent leisure facilities it has to offer. The Apollo Health Spa contains a stunning indoor heated swimming pool, a sauna, a spa room and a superb range of beauty treatments for both men and women; a haven from the crushing hurly-burly of everyday living and the perfect prescription for that weary traveller’s schedule. Guests can choose from dining at Vespers Award Winning Restaurant, with its AA Rosette, or grab a tasty light-snack in the Library Bar or from the Brasserie with its wide choice of options and children’s menus.